I'm a big fan of small greenhouses. The best money I've ever invested on my farm has been to build my little lean-to greenhouse and the somewhat larger mobile greenhouse on rails (inspired by Eliot Coleman.) My greenhouses have more than paid me back for the time and money I spent in constructing them. In my opinion, this is one of the first tasks a small farm should undertake. Here's why building a greenhouse is a great investment for a small farm. 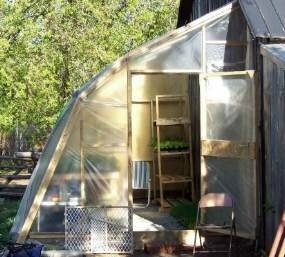 Small greenhouses are cheap to build. A light frame (of wood, steel or PVC) covered with poly is the cheapest covered space you can create. Depending on your resourcefulness, they can cost you a couple bucks per square foot, or even less. Both my lean-to greenhouse and the mobile greenhouse were built with steel hoops I bartered for with a neighbour. My cash outlay for the framing lumber, screws and bolts, and 5-year greenhouse plastic brought the cost per square foot to about $1.50 for the lean-to and $2.50 for the bigger one. Even my little lean-to greenhouse (about 160 square feet) produces thousands of dollars worth of transplants each season. The production per square foot would probably be in the range of $15-20 or more, if I calculated the value of the transplants the greenhouse produces. Small greenhouses are easy to manage. My greenhouses don't require complicated and expensive heating, ventilation or irrigation systems. I water the greenhouses with a hose and sprinkler. Since I operate my greenhouses seasonally (the big one from March to November, the little one from April to October), I don't need a lot of extra heat. If frost threatens my lean-to greenhouse, I just stick in a small portable electric heater. I did put a thermostatically-controlled ventilation fan in the bigger greenhouse; this cost about $200. The lean-to greenhouse is ventilated with a cheap box fan ($25) that I turn on in the morning, and turn off at night. Small greenhouses come in all shapes and sizes. Turn your imagination loose; a greenhouse can be constructed in lots of ways. One of my gardening neighbours used a fast-framing kit intended to make a small shed to build her little greenhouse. The plastic and 2x2's cost her less than $50. My farm helpers from a couple years ago (they now operate their own market garden) scrounged a used garage shelter kit. They covered it with clear poly, and now have a very productive 10 x 20 greenhouse. They used pool noodles wrapped around the piping to protect the greenhouse plastic, so it's pretty colorful, too. Best reason: greenhouses are just plain fun!